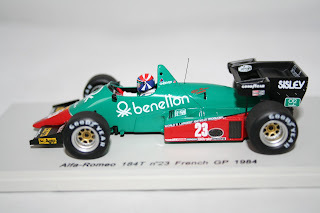 Hart Motorsport still have a limited number of this stunning Spark Alfa Romeo F1 car as driven by Eddie Cheever in the 1984 French Grand Prix left in stock. Already sold out at suppliers this model has proved to be very collectable and is one of the most detailed 1:43 scale F1 cars we have ever stocked. Once sold out we will be unable to get re stocks so hurry while stocks last. Hart Motorsport have just taken delivery of this beautiful 1:43 scale Spark model Lotus 102D F1 Car. 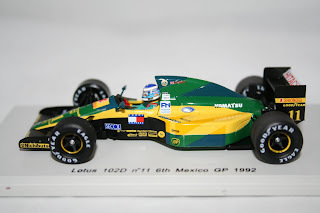 This model is the version that Mika Hakkinen drove to 6th place in the 1992 Mexico Grand Prix. These Spark models are second to none and the detail is amazing. We are also please that Minichamps have already announced that they we be releasing the new 2010 Lotus F1 car later this year, another model that we are looking forward to receiving. Hart Motorsport have just received the eagerly awaited Minichapms Valentino Rossi Figure from the 2008 Barcelona Moto GP Race. Limited to just 2,846 worldwide this model is sure to sell out very fast. 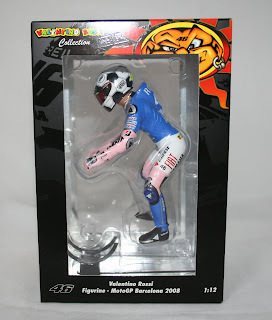 The model is a one off and features Rossi in the Italy Football Team Colours. We are expecting the Yamaha M1 in matching colours in the next few weeks. We have also received re stocks on a number of different 1:8 scale Minichamps Rossi Helmets this week. For details on all these models please visit our Internet shop below. Hart Motorsport have just received the latest release from Hotwheels. 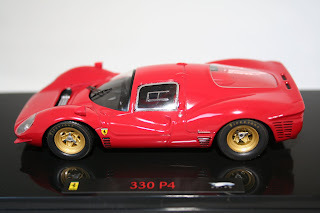 The stunning 1:43 scale Ferrari 330 P4 sports car is now available from our shop below for £30.99. This is the first of many different versions of this car that Hotwheels will be releasing throughout the year. It's been a quiet week at Hart Motorsport as far as new releases are concerned with only three new models in stock. 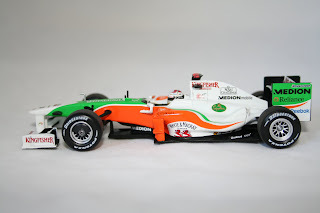 We have just taken delivery of the brand new Minichamps Force India VJM 02 F1 Car driven by A Sutil in the 2009 F1 Championship. A new Kyosho Ferrari 250 GTO model from 1964 has also arrived, like the previous 250 released by Kyosho the detail on this model is fantastic. The third model is a Minichamps Tyrrell 012 F1 car from 1983, driven by D Sullivan. We have also has re stocks of the new Jorge Lorenzo YZR M1 Moto GP bike as sales of this model are going well. Due in the next few weeks are the latest Spark F1 Cars including a Hakkinen Lotus a Tambay Renault and Eddie Cheever's Alfa Romeo. We will keep you updated as soon as they arrive. All these new models plus 100' more are available from our shop below.